Date & Place: Monday 4th March, in the IOE Bedford Way, Room 784. The peaceful protests which have swept Algeria formed a compelling backdrop to this fascinating paper by Arthur Asseraf, framing the timely nature of its central concerns about news, communication, and the way that we relate to the world around us. We heard about how the vast protests of 22 February were near invisible on Algerian state media, which chose to broadcast a nature documentary instead. This seemed to offer broader insight into the bubbles in which information percolates into our world-view, though Asseraf asked: is this new? Assumptions around the novelty of these seemingly 21st century phenomena belie the stories of 19th and 20thcentury media. The development of electric news can provide a meaningful route into understanding these dynamics: from the ‘fausses nouvelles’ described by a colonial sous-prefet, to competing language politics, state surveillance, and the distortive impact of new media technologies. 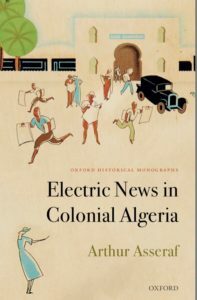 In exploring this, Asseraf first focussed on Algiers in 1881 as a rich moment in which to read the dynamics around news transmission. As news of war in Tunisia drifted back to Algiers, so too did rural populations desperate to find out the latest from a city abuzz with different formats of news: newspapers, word-of-mouth, and even song. The printing press arrived with the French in 1830, and the telegram was likewise swiftly imported to help connect the Algerian periphery to the Metropolitan centre, but new forms of communication did not erase older forms of news that continued to exist alongside them. Asseraf discussed how different focusses changed the perspective of study: whereas looking at ‘intelligence’ drew the inquiry closer to the state, ‘information’ prioritised data and forms of transmission. Rather, by looking at ‘news’, Asseraf sought to prioritise the ways in which people understood, processed, and sorted recent events that were relevant to their lives. We then heard more about Algeria during the First World War, and in particular the ways in which an insurrection in Mascara in 1914 followed the killing of two French officers organising conscription. Asseraf discussed a manuscript discovered circulating by the state (and preserved in the archives of colonial surveillance) which blended the immediacy of news with a somewhat mystic style. The manuscript styled itself a history, charting the emergence of the French as a people, before adopting a prophetic tone that foretold a war between the French and Prussians and calamity for the French empire. This was a blend of defeatism and anti-colonialism, drawing together different styles and means of communication. The state took an interest in monitoring these war-time whispers, and another example showed a Spaniard discovered in a local cafe spreading rumours of French defeats in Arabic, drawing information from French-language newspapers to support his claims. Nearby, as it happens, Marc Bloch was serving the colonial state during another revolt in 1916, providing a compelling contrast around ideas of modernity through the eye of the celebrated Annales historian. Asseraf contrasted the historic pamphleteer claiming prophetic knowledge of the future, and the historian dismissing local rumour as representing a retrograde sensibility. Between these two poles, and between these two bubbles, he contended, we can see a synchronic picture of different understandings and orderings of time. This, in turn, told us something of the ways in which news both cut across different social categories and reinforced them. The dense network of telegram connections was designed to grow a sense of ‘Frenchness’ in Algeria by ensuring a connection to the Metropole, for example. It also made Algerian Muslims better connected to the news world of the Ottoman empire, however, both cutting across the binary division of the European settler population and the wider population while strengthening their respective group identities. These stories of interconnection and information encouraged us to think meaningfully about our own role as historians and our relationship to contemporary news, as well as the broader category of news in our work. Asseraf’s timely work will be published by Oxford University Press this summer.